It was a Sunday morning opportunity to raise the comfort level at the 2017 Ford World Men’s Curling Championship, and Team Canada took full advantage at the Northlands Coliseum. A first-end deuce, followed up with an immediate steal of four in the second end, were more than enough to propel Brad Gushue’s St. John’s, N.L., team to an 11-3 win over Russia’s Alexey Stukalskiy. 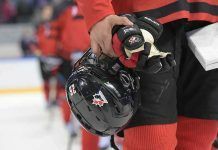 With the win, Gushue, vice-skip Mark Nichols, second Brett Gallant, lead Brett Walker, alternate Tom Sallows, team coach Jules Owchar and national coach Rick Lang remained undefeated at 2-0, while the Russians dipped to 0-2. It was Gushue who engineered the first-end deuce, tucking a beautiful draw behind a Russian guard, and when Stukalskiy couldn’t follow up with the runback, Gushue followed the same path as his first to get the pair. Canada ramped up the heat in the second; Russia started the end trying to generate offence but couldn’t follow through, and spent the rest of the end unsuccessfully trying to bail out as the Canadians deposited rock after rock in the house behind cover. In the end, Stukalskiy’s last-gasp raise attempt didn’t connect, leaving Canada with four counters in the rings, and from there it was simply a matter of time. The win set the stage for a highly anticipated early showdown on Sunday evening against Sweden’s Niklas Edin (1-0), who’s taken gold on at the past two Ford Worlds staged in Canada — 2013 in Victoria, B.C., and 2015 in Halifax. Gushue, it should be noted, has an 11-2 career record over Edin, with Gushue prevailing 8-3 in their only meeting this season, the championship game of January’s Grand Slam Meridian Canadian Open in North Battleford, Sask. Interestingly, while Gushue was on the sidelines recovering from his hip/groin issues and Nichols was skipping in his stead, Edin was 4-1 this season against three-quarters of Team Gushue. In the only other game on the ice Sunday morning, Japan’s Yusuke Morozumi also improved to 2-0 with a 9-6 win over Jaap van Dorp of the Netherlands (0-2). Sweden, Norway’s Steffen Walstad (1-0), Germany’s Alexander Baumann (1-1), Italy’s Joel Retornaz (1-1), Switzerland’s Peter de Cruz (1-1), John Shuster of the United States (1-1), China’s Rui Liu (0-1) and Scotland’s David Murdoch (0-1) had byes on Sunday morning.